A Scorpio may appear calm and self-controlling on the outside while on the inside, they are very emotional and overall passionate about life. Just because a Scorpio loves you, it doesn't mean they will do everything you want them to. They are their own person. 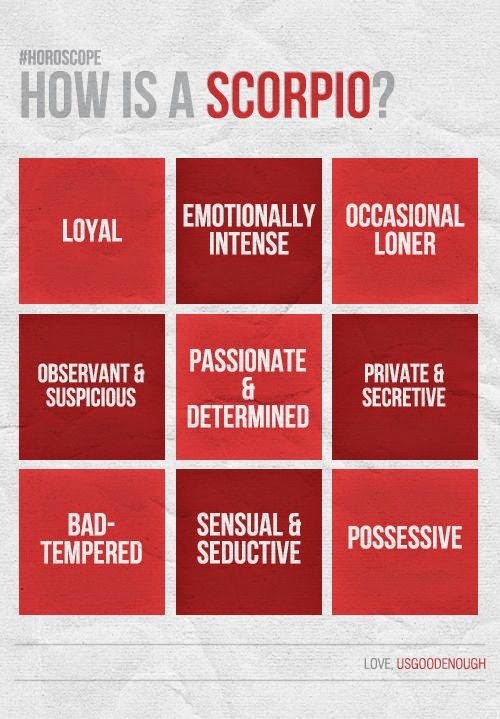 Scorpio possesses a strong and bold personality which attracts others. They have a hard time asking for help from others even if it is for the littlest thing. 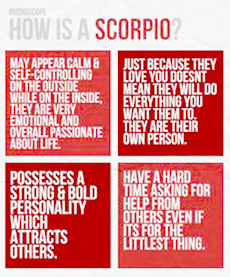 Scorpio loves to please (people they like and love) and tends to be overprotective. Scorpio can become extremely talkative once they're comfortable with you. Scorpio can be extremely hard to read because they don't talk unnecessarily and their facial expressions can be mysterious (if they choose to). 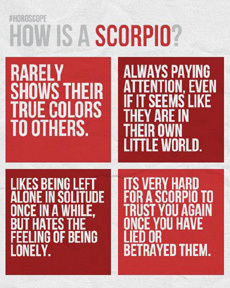 Scorpio rarely shows their true colors to others. Scorpio like to be left alone in solitude once in a while, but hates the feeling of being lonely. Scorpio are always paying attention, even if it seems like they are in their own little world. It is very hard for a Scorpio to trust you again once you have lied or betrayed them. 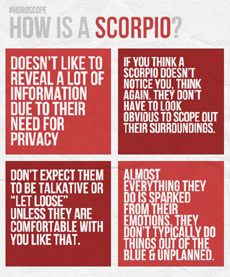 Scorpio doesn't like to reveal a lot of information due to their need for privacy. If you think a Scorpio does not notice you, think again. They don't have to look obvious to scope out their surroundings. Don't expect Scorpio to be talkative or let loose unless they are comfortable with you like that. Almost everything they do is sparked from their emotions. Scorpios don't typically do things out of the blue and unplanned. 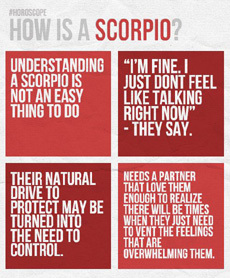 Understanding a Scorpio is not an easy thing to do. Something a Scorpio would say: "I'm fine. I just don't feel like talking right now." Scorpio's natural drive to protect may be turned into the need to control. Scorpio needs a partner that love them enough to realize there will be times when they just need to vent the feelings that are overwhelming them. That person that Scorpio respects and holds close is treated with amazing loyalty, generosity and kindness. 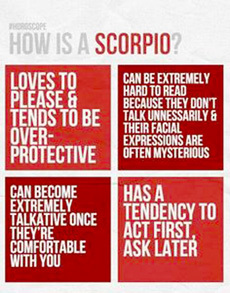 Scorpio likes to talk and act withouth much expression. It's hard for them to use facial expressions to display their inner world. When feeling troubled, Scorpio are nearly impossible to read. They tend to distance themselves as well. 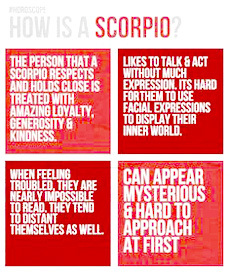 Scorpio can appear mysterious and hard to approach at first. 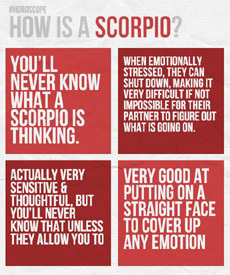 You'll never know what a Scorpio is thinking. When emotionally stressed, Scorpio can shut down, making it very difficult, if not impossible to figure out what is going on. Scorpios are actually sensitive and thoughtful but you'll never know that unless they allow you to. Scorpios are very good at putting on a straight face to cover up any emotion. Scorpio often deals with the inner battle of keeping their desires from taking over their rational thinking. "A lot of people can't handle me... but if you'd take the time to understand me, you'll realize that i am not that difficult." 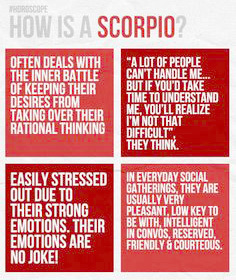 Scorpio can be easily stressed due to their strong emotions. Their emotions are no joke! In everyday social gatherings, Scorpios are usually very pleasant, low key to be with, intelligent in convos, reserved, friendly and courteous.